August 22, 2015 (San Diego’s East County) – Monsoonal flows could bring afternoon and evening thunderstorms, lightning and heavy downpours Monday through Thursday in East County, along with gusty winds. August 13, 2015 (San Diego’s East County) –The National Weather Service has issued an excessive heat warning for San Diego County deserts and a heat advisory for mountain and valley areas. The warning and advisory are in effect from Friday at 1 p.m. to Monday at 9 p.m. Temperatures are forecast to reach 116 in Borrego Springs, 105 in Campo, 104 in Ramona, 102 in Alpine and 100 in El Cajon, shattering prior records. July 19, 2015 (San Diego) – Saturday’s deluge, remnants of a hurricane off the Baja coast, set a new record rainfall for the month of July in San Diego and many other local cities, Alex Tardy, Meteorologist Manager at the National Weather Service, San Diego reports. At Lindbergh Field airport, 1.03 inches of rain has fallen so far this month, topping the old record of 0.92 inches set back in July 1902. Anza-Borrego Desert State Park got 1.16 inches and Ramona’s airport got a full inch. Campo received .99, while Alpine and El Cajon measured .95 inches on Saturday, putting all of these communities above normal for the whole month of July. The downpour forced cancellation of some events, such as Concert at the Lakes in Santee. July 18, 2015 (San Diego’s East County) – The National Weather Service has issued a flash flood watch for the mountains and deserts through Sunday evening. Heavy rain is now falling across much of East County, with thunder and lightning reporting in La Mesa, El Cajon, mountain areas and other locations. Moisture from Hurricane Dolores will continue to spread northward into Southern California today and Sunday, bringing thunderstorms and locally heavy rainfall. Flooding is reporting in Alpine at Tavern and East Willow Road exits. A fire was reported at 94 near Shockey Truck Trail. Fire crews have also been dispatched to Kitchen Creek near Cameron Truck Trail, per scanner traffic. An earlier fire on Highway 67 near Slaughterhouse Canyon is out, halted at about 3 acres. Power lines are down and a power pole reported leaning across the roadway at Dye Road in Ramona. SDG&E reports power outages in Eastlake/Otay are impacting 171 customers with restoration estimated at 6:30 p.m.
A larger outage is affected 623 households in Dulzura, Potrero, Campo, Japatul Valley, Buckman Springs, And Morena Village areas with rsetoration estimated for 4:30 p.m.
June 16, 2015 (San Diego’s East County)--With prolonged high temperatures expected to reach up to 115 in San Diego County deserts over the next few days, County health officials are reminding the public to take precautions to avoid heat stroke and other heat-related illnesses. The National Weather Service in San Diego has issued a heat advisory in effect now through Sunday at 7 p.m. for the lower desert areas of eastern San Diego County. Temperatures inland will be anywhere from 5 to 10 degrees above average with high temperatures forecast of 112 to 115 degrees. Nighttime temperatures will only drop into the 80s. Mountain and foothill areas in the county are expected to be warm as well with highs in the 90s. Coastal areas will be near-normal temperatures. The County operates the Cool Zones program and has designated more than 115 air-conditioned buildings as cooling centers. Locations and hours of operation can be found on a new interactive map on CoolZones.org or by calling 2-1-1 San Diego. The sites are identified by a light blue Polar Bear Cool Zone logo. February 27, 2015 (San Diego’s East County) – A winter storm is due to hit our region tonight through Monday, bringing strong gusty winds to mountains and deserts. Possible thunderstorms are possible starting Sunday night, bringing rain and potentially heavy snowfall down to levels that may include Julian, Descanso and Pine Valley. The Sheriff offered this reminder to motorists traveling in the mountains: Have a full tank of gas, water a nd food supplies in case you are stranded in traffic for several hours. Have snow chains for areas where they will be required. Public restroom facilities are limited...Be mindful of areas that are private property which are marked by signs and fences. Private property is off limits to the public for recreational snow activities. Parking violations will be enforced and citations will be issued. Vehicles blocking roadways and private property will be towed. Be aware of increased law enforcement activity to handle the large crowds. December 31, 2014 (San Diego’s East County) – A thick blanket of snow has fallen across much of San Diego’s inland region, transforming the terrain into a winter wonderland this New Year’s Eve. Lindy Klengler sent photos taken at her Hidden Meadows home in Escondido at just 1700 feet elevation, showing snow around her swimming pool and atop palm trees. “Been here 22 years and never had this happen,” she says. Melody Munoz and Donna Tisdale sent photos from Boulevard, where three to four inches of snow fell overnight and the temperature on New Year’s morning is a chilly 21 degrees. 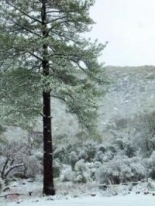 Snow has also blanketed Descanso and coated landmarks in Jacumba. December 29, 2014 (San Diego’s East County)--The National Weather Service has issued a winter storm warning from 4 p.m. Tuesday night until 4 p.m. Wednesday for areas above 2,000 feet in elevation – though a dusting of snow could dip down to just 1,000 feet in some areas. The storm, originating in Canada with very cold temperatures, could dump up to a foot of snow at elevations over 3,000 feet and 1 to 5 inches between 2,000 and 3,000 feet. Two to seven inches are forecast in high desert regions. December 26, 2014 (San Diego)—The National Weather Service is forecasting frost for the next two nights, through early Sunday morning. Saturday is expected to be the coldest nights. There will be areas of frost and freezing temperatures in San Diego County’s valleys and deserts. In addition, frost is also forecast for the north coast, particularly Oceanside. December 15, 2014 (San Diego’s East County)--A dip in the jet stream along the West Coast is bringing more wet weather starting Monday night through early Thursday this week. The heaviest rain will be Tuesday morning and again Wednesday morning, with thunderstorms possible on Wednesday, the National Weather Service predicts. Snow is forecast to fall in the mountains, with snow levels falling as low as 4500 feet by Wednesday. A total of 6-12 inches could pile up above 5500 feet by Wednesday night, which includes Mount Laguna here in East County. December 11, 2014 (San Diego) – A powerful storm is set to drench our region, bringing torrential downpours of up to a half inch of rain per hour. A flash flood watch has been issued through late Friday night, with highest risk in areas burned by recent wildfires including the Cocos Fire. Dangerous surf conditions will occur along the coast. Strong rip currents are forecast, with waves of 7 to 14 feet Friday and Saturday. December 1, 2014 (San Diego) – The National Weather Service has issued a flash flood watch for Tuesday and early Wednesday in San Diego County’s mountain, valley and coastal areas. Mountains and recent burn areas will have the greatest threat pontetial with up to five inches of rain forecast; be prepared for flooding and debris flows. Moderate to heavy rain in coastal and valley areas will produce urban flooding in flood-prone low-lying areas and streets with poor drainage. November 26, 2014 (San Diego’s East County)—Grab the galoshes and fill up your sandbags—a deluge is set to soak our region early next week. Moderate to heavy rains are forecast—along with possible flash flooding and snow. National Weather Service forecaster Alex Tardy predicts up to five inches of precipitation in some mountain locations, with heavy snowfall possible above 6,000 feet. November 4, 2014 (San Diego) -- With strong, gusty winds and low humidity in the forecast, the National Weather Service has issued a Red Flag warning effective immediately for the inland valleys and mountains. The warning is expected to last until 5 p.m. on Thursday night. Santa Ana winds of 20-30 miles per hours are forecast, with gusts up to 55 miles per hour in places. The Santa Ana Wildfire Threat Index for San Diego (Zone 3) indicates that the threat will peak on Wednesday with a threat rating of moderate. Hurricane Odile has struck the coast of Baja California, Mexico in Cabo San Lucas at record speeds of 125 miles per hour as a category 3 hurricane. Up to 11 inches per hour were reported in the tourist resort town, according to CNN. As Odile moves north, it is not expected to make landfall near San Diego. However moisture from the system could bring significant rainfall across our region Wednesday and Thursday, the National Weather Service Reports. The risk of flash flooding will also increase by mid week. September 7, 2014 (San Diego's East County)--The National Weather Service has issued a flash flood watch for San Diego’s mountains and deserts this Sunday and Monday. A surge of deep monsoonal moisture around tropical cyclone Norbert off the Baja coast will bring a high threat of showers and thunderstorms, particularly in the afternoons both days. There is potential for three inches of rain and flash flooding, with greatest risk below desert slopes and recently burned areas. July 25, 2014 (San Diego’s East County)- A hazardous weather warning remains in effect through tonight across our region, with high temperatures expected to continue through this weekend, cooling slightly. Thunderstorms are also moving across the region. July 18, 2014 (San Diego’s East County) – An upper level trough over the Gulf of California tonight will move northward across Northern Baja, then sweep into Southern California tonight and Saturday. Thunderstorms with dry lightning are possible on Saturday morning, mainly over the mountains. Heavy rain producing thunderstorms are more likely to occur during the afternoon and early evening hours. Lightning may ignite fires and heavy rain could produce localized flooding. Downdraft wind gusts of 35 mph or more are possible during the storms. Forecasters also warn of high heat next week, when a large area of high pressure will build over the West, bringing warming each day Tuesday through Thursday. By Wednesday and Thursday, maximum temps will be 5-10 degrees above average, soaring into triple digits in desert areas. July 4, 2014 (San Diego)—The National Weather Service has issued a flood advisory for San Diego County’s mountains and deserts through early evening. In addition, the NWS warns of strong rip current in San Diego’s coastal areas today through Monday. The urban and small stream flood advisory remains in effect for Warner Springs, Ranchita, and the Felipe burn area northeast of Julian until 6:45 p.m.
June 29, 2014 (San Diego’s East County) -- The San Diego region ends the first six months of this year with just over 5 inches of rain – less than half of normal. If you’re planning some outdoor activities over the Fourth of July holiday, the weather forecast is warm and sunny, with temperatures about 5 degrees above normal through the end of this week. May 15, 2014 (San Diego) – High temperatures are forecast to continue this weekend, cooling off early next week. Today, sunny weather with a higher of 105 a low of 62 is forecast. A red flag warning for high fire danger continues through 5 p.m. this evening. Friday and Saturday will be sunny with a high of 96 on Friday and a high of 84 on Saturday; lows are forecast around 56 degrees both days. April 30, 2014 (San Diego’s East County) – High winds caused damage across East County today, with hurricane-force gusts up to 101 miles per hour recorded on Sill Hill near Cuyamaca. In Buckman Springs, motorists trapped in a car beneath a fallen tree limb had to be rescued. Interstate 8 east of Alpine was closed temporarily due to high winds. A fallen eucalyptus tree blocked Otay Lakes Road late this morning. Most tragically, a wind-whipped fire that scorched an acre near Plaza Bonita mall killed a person, whose burned body was found near a transient camp. Power outages occurred across East County. In Descanso, some residents were without power for 13 hours, from 6:30 a.m. until approximately 9:30 p.m., ECM correspondent Sharon Penny reports.